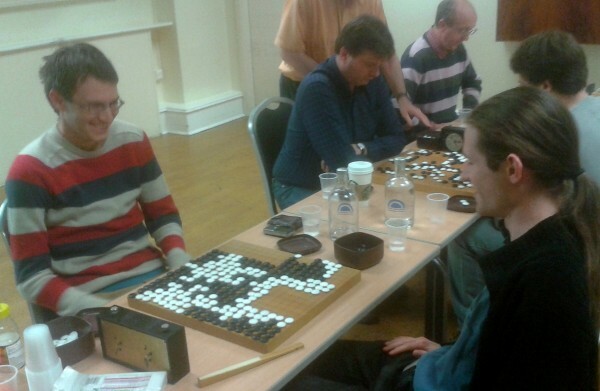 Reigning British Champion, Andrew Kay 4d, and fellow Cambridge University graduate Andrew Simons 4d, have emerged as the finalists for the British Go Championship from this weekend’s Challengers’ League. Simons is the Terry Stacey Grand Prix 2013 title-holder (awarded for best tournament results over the year to the British Go Congress last April). The pair will meet for the best-of-three final at a time and place yet to be fixed, to decide who will take the title of British Champion. As both players intend to travel to Asia over the next three months, the final will probably not take place before August. When it does happen, it is likely to be followed live in the British Room on the KGS go server, with professional commentary. In the Challengers League, which ran from Friday till Monday, each of the eight most successful players from the Candidates’ Tournament (see the EJ from May 10th), held earlier this month in Edinburgh, played one game against each other, with 1 hour 45 minutes main time each and 15 stones in 5 minutes repeating overtime. Under British Go Association (BGA) rules, the current title-holder was required to play in the Challengers’ League on the same terms as the other seven, and in fact Kay also waived his right to be entered automatically, winning his place at the Candidates’ Tournament as the others did. He said of this decision, “I’m always keen for an opportunity to play a high-level game of go with a reasonably long playing time and I like Edinburgh”. The other six challengers, in order of score, were: Alex Kent 2d, Alex Rix 2d, Des Cann 4d, Boris Mitrovic 2k, Francis Roads 1d, and Tim Hunt 2d.